With being lucky enough too travel to so many places around the world, I thought it would be nice to have something physical to show others where I have been too. I had previously purchased a “Scratch Map” (here) which is basically an A3 laminated map of the world with golden foil over the countries, the idea being that you scratch off the countries that you have visited. While it’s quite a good idea, it is really small and doesn’t really allow me to do what I wanted to do, which is to mark the cities as well as the countries I have visited. 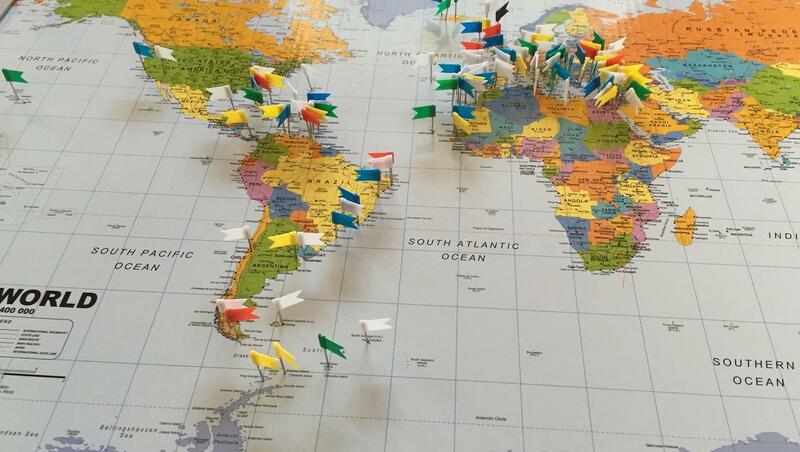 After some searching of Amazon I found a cork board map of the world (here) and bought a load of flag pins. I’m fairly impressed with the size and quality of it – a lot of the reviews said it was pretty dodgy but it actually looks really good and if all else fails you can just turn it around and use it as a normal cork board. If you are going to do the same; I quickly discovered a small problem with my plan of using flags when it came to where I had visited in Europe – it’s far to crowded and I couldn’t actually fit all the flags in. If you’re likely to have the same problem I would suggest using pins with the ball head’s might be a better option than flags. Also I ordered a pack of 100 flags and ran out fairly quickly, so make sure you order enough pins! Since I stuck a photo up on Facebook, several people asked where I got it from, you can find the products I used on Amazon through the links above. Your email address will be kept private! The views and opinions posted are those of myself and not necessarily the views shared by my employer(s) or other related parties. This site allows visitors to post comments, these are the views or opinions of the original poster and may not be shared by myself.